﻿ Welcome to Expo 67! 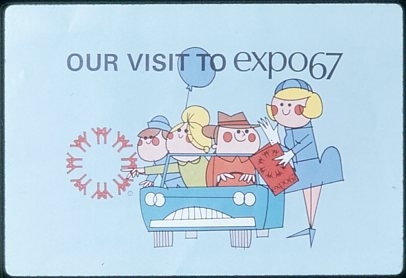 As a young boy of 13, I had the unique opportunity of seeing Expo 67. I saw "Man and His World" on at least two occasions. If you were like me, you were probably spell-bound by the breathtaking pavilions on display from around the world. Expo 67 presented endless dreams and possibilities of what man and his world of tomorrow might look like. The arrival of Expo 67 was perfectly timed as a salute to Canada as a nation on it's 100th birthday anniversary. When organizers planned this world exposition, they had predicted that only 35 million people would show up. In fact, the enormous success of Expo caught the organizers off guard and much to their surprise, between April 28 and October 29, 1967, over 50 million people from around the world showed up. And much to a visitor's consternation, some of the line-ups just to get into some pavilions would be at least a few hours. In the end, all the Expo pavilions were well worth seeing. But here at this web site, you can revisit Expo 67 once again in the comfort of your own home in front of a monitor with no long line-ups. I've made this site as "user-friendly" as technology can allow...I hope you enjoy the memories!